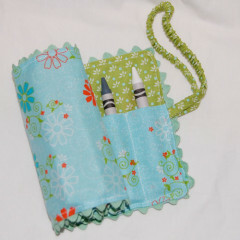 I’ve just posted some new crayon rolls I made last week in my store (click the “Shop” link above to go there now). There’s some really cute patterns, so grab one while they are still available — they tend to go fast! Also look for two that are discounted… I accidentally made the end pockets a little too narrow. A crayon still fits there, but they just aren’t up to standard, so I dropped the price for those two.